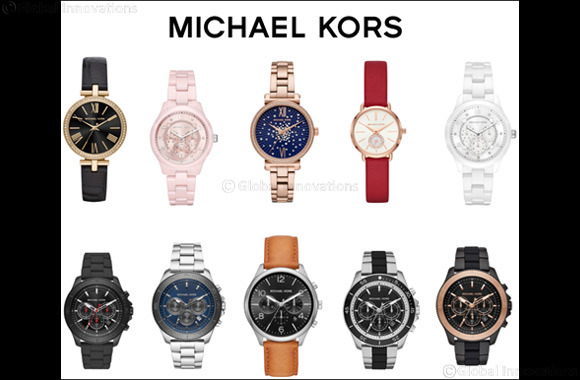 October 25, 2018: The Michael Kors Holiday 2018 watch collection reimagines the classics with irresistible sparkle, while introducing new designs that exude undeniable sophistication. Novelty and glamour take the spotlight with party-perfect pieces you’ll want to give and receive. The iconic Runway style from fall will be updated for the holiday season with glittering pavé crystals and eye-catching new colors. Pretty and polished, the Pyper family has a classic look with a slim profile. Designed with a rose gold-tone case, it comes in two leather strap options: blush and red. A watch that equally sparkles and shines—the Channing dazzles with a beautiful frosted dial and comes in gold-, rose gold-, silver- and black-tone. Finally, black watches make a striking statement for the holiday season in Channing, Runway, Sofie and Mini Lauryn styles. For men, we’ve created the Theroux Sport, a bold and sporty extension of the group introduced in fall. New styles include polished stainless steel bracelets and a cool combination of silicone and steel, available in a variety of colors.